Where have we been for the last two months? Prepping and planting, of course! Under the shade cloth are about 8 tomato varieties, and 15 or so pepper varieties. If you have seedlings going, it’s time to get them outside to harden out for warmer temperatures. Don’t expose them to full sun right off the bat or their delicate little leaves will fry. Just an hour of first sun in the morning, then a little more after a week of brief daily exposure. It’s clearly spring on the farm, with flowers in full bloom, trees fully clothed in bright green leaves, and weeds doing what weeds to best: take over every inch of bare soil. Love my Hula hoes! Second sets of leaves are appearing on the direct-sowed spring crops. Young kale, broccoli, cabbage, and radish are looking healthy and happy with the alternating sunshine and rain showers. We are harvesting salad lettuces (the clip and regrow types) we had started in the cold frame, and our second crop of out-in-the-open lettuce is about 1/2 inch tall. If it’s your first time to the you-pick, let us know you’ll be here and we’ll show you around. A couple of changes we’ve made this spring will help with summertime maintenance and increase variety in our fruit options, and make the garden more accessible. We removed 80% of our native currants, which created a lot of work for a huge crop that people didn’t want. A small crop is fine, and the remaining 6 bushes will produce more than enough berries for pies and jam. Removing those 40+ currants made room for blackberry and raspberry canes, which should arrive this month. We also were able to double the space we have available for our existing strawberry patch. Who doesn’t LOVE fresh picked strawberries? By the end of summer, all of our permanent walkways will be lawn. After noodling with a number of options, the growing beds between the grassy walkways retain water better than the beds between gravel or bare ground walkways. Benefits to both wobbly walkers and the plants in the beds far outweigh the extra mowing time that grass walkways will bring. This week, we continue to clean up, till, and prep for the coming weekend’s work. 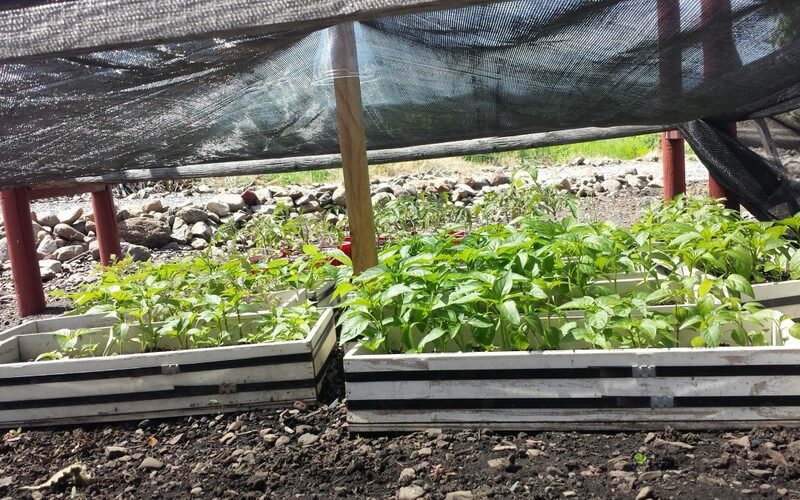 On schedule: transplanting tomato and some of the pepper starts to their summertime homes, direct sowing cucumbers and squashes, and weeding the garlic patches. Time permitting, we may even get onions and potatoes in the ground, too.